NOTE: 10 Adults allowed, Resort will only issue 6 pool passes. Children 12 and under do not need pool pass!!!! 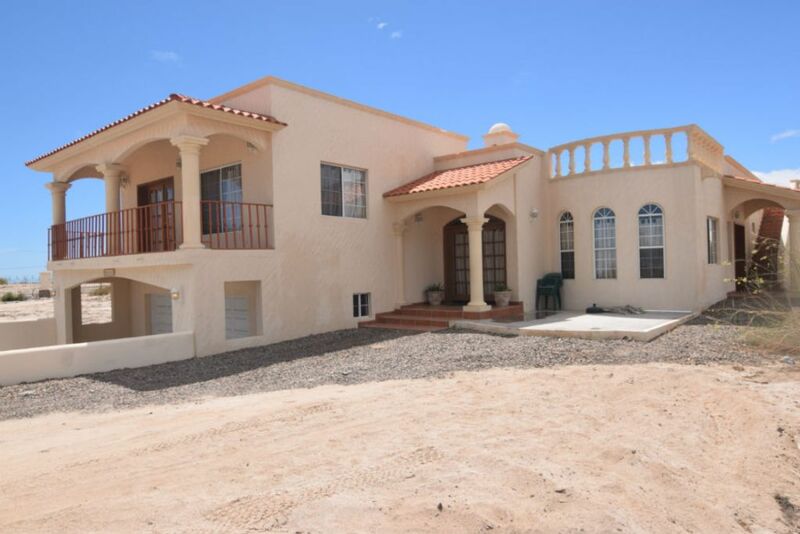 This home is managed by MySanFelipeVacation, San Felipe's one stop shop for all your vacation rental needs. See our Yelp reviews. This extremely spacious home is just what you need for a sweet vacation! Beach, tennis, pools, and golfing available.Kitchen has all the appliances and amenities, you just bring the sweetness!Casa la Vida Dolce has 3 full baths and 3 bedrooms. Two are masters with queen beds and the third has spiffy twin beds. This home comfortably sleeps 6 guests. See bed pictures and please ask if any questions. Then you get the icing on your cake!! !Rooftop deck with Gas BBQ and 360 degree views of the 18 hole Championship Las Caras de Mexico golf course ( 2 free rounds per day included in your stay), the azure blue Sea of Cortez, plus the cherry on the top of it all , the towering 10,500 foot peaks of Mount Diablo, to the west!Sunrise or Sunset You'll be kings and queens of your very own Sweet Shop, Casa La Vida Dulce! MONTHLY RENTALS: Utilities are extra. You'll be given copies of the bill. NOW TO ME: Thanks for checking out my listing. I'm Erick and run MySanFelipeVacation vacation rental homes in San Felipe, Baja California, Mexico. I'm originally from San Felipe. I moved to the US as a kid and went to school in Oroville, California. I moved back to San Felipe, got married and have two beautiful kids. Growing up in the US, I learned a lot about the high standards guests expect and have brought this experience to all properties I manage. My listed homes are owned by Americans and Canadians who visit once or twice a year. When owners are not in town, the home is available to reserve. Each home's decor is unique in that it reflects the owner's style. My goal is to help you enjoy San Felipe to the fullest. When you reserve any of my homes, I will send you an email with a list of things-to-do both locally in San Felipe and some which are day trips. (I am not able to share this with you now as HomeAway does not allow adding website links). Depending on the length of your stay, you get to chose which you'd like to do. One of the trips I recommend is doing a fishing trip to Konsag essentially a fishing and sightseeing trip. All this and more will be in my list of things to do email. One question I get pretty often is whether we use non-toxic cleaning products while cleaning properties I manage. The answer is YES . We use organic cleaning products sourced from the local Prolisa organic store. Our guests appreciate this and it is also better for our cleaning crew who regularly come in contact with the cleaning products. During your stay, please do not hesitate to contact me with any questions or if you need tip. I look forward to meet you. 18-hole golf course on site. This home is managed by MySanFelipeVacation - your one stop for all your vacation rental needs. This home comfortably sleeps 6 guests. If guest brings 2 airbeds, 4 more guests can be accommodated for a maximum occupancy of 10 guests. See bed pictures and please ask if any questions. It is a beautiful home that worked very well for our small group. The only issues we had were that none of the electrical plugs worked in the bedroom on the left on the main floor or the bathroom on the main floor. There was also a drip in the hot water faucet on the main floor that leaked onto the floor. Other than these couple of items it was a wonderful stay. Thanks for the review Guy. We'll certainly look into the items you mentioned and have this resolved ASAP. Thanks again and look forward hosting you again soon. Very happy with the accommodations. the house is big and it was able to handle our crew of 10 easily. Check- in was easy and Erick's staff is excellent. Erick answers very fast to calls, texts and emails. The house is very clean and in a safe gated resort. It is quiet except for one night where we had strong winds haha. If you are looking for a quiet, safe comfortable place this is it! If you are looking for the spring break party scene this is not the place for you. Erick's place is 13 mins drive into town. You can walk to beach and pools, but more convenient to drive. Erick is a great host!! Very kind and accommodating. The house is large with 3 bedrooms and the bedding was clean and adequate. The home could use a little maintenance in the bathrooms. Dishsoap was the only amenity supplied so luckily the stores in San Felipe made it easy to buy toilet paper, dishcloths & towels, salt and pepper etc. There is plenty of silverware, plates, and a few pots and pans to make do. The staff were helpful and the security was good. during the holidays in this home. It is located within walking distance to the golf course, beach and pool area.